When you heard the words, "It's a girl," and images of big bows, ruffled outfits and everything pink danced through your head, you probably began looking for ways to add extra girly touches to all that hard plastic baby gear you would need. Get creative with a bit of tulle and ribbon to transform your sweet little girl's highchair into a seat truly fit for a princess by making a washable highchair skirt. Use the skirt on special occasions, like her first birthday and holidays, or as an everyday added decorative touch to help blend the highchair into your existing decor. 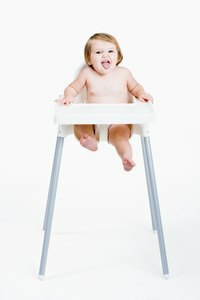 Measure around the highchair at tray height while the tray is attached using a tape measure. Cut a piece of 1-inch-wide elastic to this length. Overlap the ends of the elastic 1 inch. Sew across the overlapping ends with a zigzag stitch with two parallel seams, one 1/4 inch from each end of the elastic. Sew back and forth over each seam three times to ensure it doesn't come undone when the elastic is stretched. Slide the elastic down onto the chair so it is at tray height. Measure from the elastic down to the ground. Double this measurement and add 3 inches to determine the length of the tulle strips you need for the skirt. Cut one 6-inch-wide strip of tulle for every inch of the chair's perimeter at tray height. So, if the chair is 48 inches around at tray height and the tray is 60 inches off the ground, you need 48 6-by-123-inch strips of tulle. Fold one of the tulle strips in half width-wise. Tuck the folded end of the tulle under the elastic band. Draw the ends of the strip through the loop of the folded end. Pull the ends all the way through to tighten the tulle down on the elastic band. Add the rest of the tulle strips to the elastic band this same way. Cut a 36-inch piece of 1 1/2-inch-wide satin ribbon. Heat both ends of the ribbon for a second with the flame of a lighter -- hold the ends close but don't put them in the flame -- to seal the ends and keep them from fraying. Tie the ribbon around the elastic band in a bow centered on the front of the tray. Adjust the spacing of the tulle strips around the elastic band so they are evenly spaced. Fluff the length of the strips out to create a full skirt around the highchair. Look in the wedding section of craft stores for rolls of 6-inch-wide tulle to save time cutting versus cutting strips from tulle off the bolt. Hand wash the highchair skirt in warm water with a bit of laundry detergent to remove any food stains from the skirt. For tough stains, such as chocolate, pre-treat the stains with a stain-removing product before washing.